Ezk 12:1-12 Lord: "You live amid a rebellious house; they have eyes but don't see, ears but don't hear. Prepare your baggage and set out as if driven into exile; maybe they'll see they're rebellious. I've made you a sign for Israel." When I did, God's word came: "Tell them, 'I'm a sign for you: as I've done, it'll be done to them; they'll go into exile....'"
One Bread One Body: We must immediately forgive from our heart, 70 × 7 times, everyone including enemies, those who don't apologize, and those who keep sinning or we won't be forgiven. It's humanly impossible; we need God to give us the power. Forgive, show mercy to those you forgive, and receive forgiveness. Passionist: The Gospels are full of forgiveness/mercy stories: prodigal son, woman about to be stoned, today's parable.... Forgiveness draws us to God. Flip "How often must I forgive? ": "How often do I need God's mercy?" Don't be afraid of sinfulness/weakness. Hiding separates us from love, freedom, and growth. I feel closest to God when in brokenness I'm open to his merciful love. DailyScripture.net: The first man owed more than a king's ransom, but after his debt was forgiven, he didn't forgive 0.001% as much. Jesus paid our ransom to free us from the unrepayable debt of sin; nothing done to us compares with that debt! We must forgive and let go of resentment. Mercy seasons and perfects justice: "Mercy flowers only when it grows in the crannies of the rock of Justice; transplanted to the marshlands of Humanitarianism, it becomes a man-eating weed" (C. S. Lewis, “The Humanitarian Theory of Punishment,” Essay Collection and Other Short Pieces, HarperCollins, p.704). Purify my heart so I may show mercy to all. 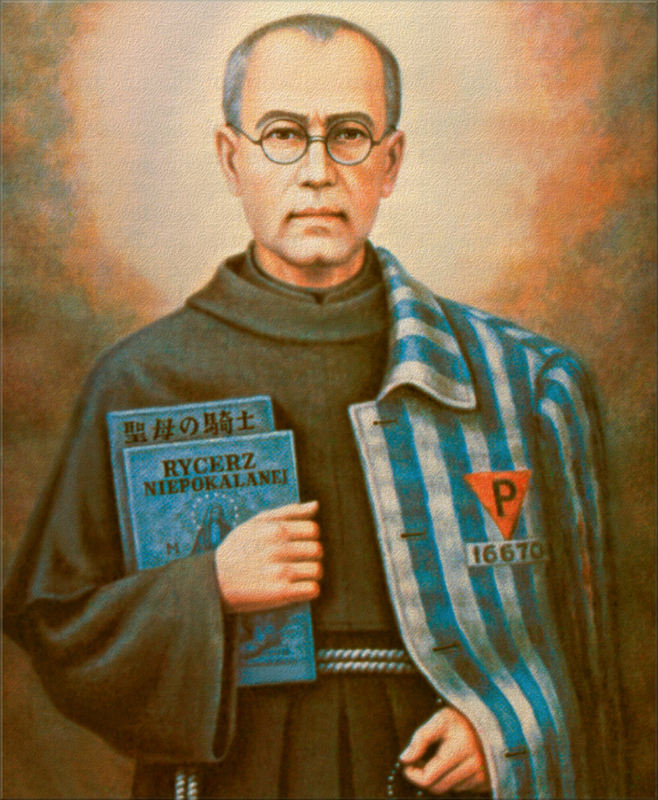 Universalis: St. Maximilian Kolbe, Franciscan priest, martyr, believed we must fight for salvation using modern communication, founded newspaper, Knights of Mary Immaculate, “city of Mary,” radio station; studied Buddhism and Shintoism; spread gospel in harmony with Japanese culture; helped Auschwitz inmates; offered to be killed instead of family man. Emulate him by becoming people of perseverance and prayer who naturally do the right thing.